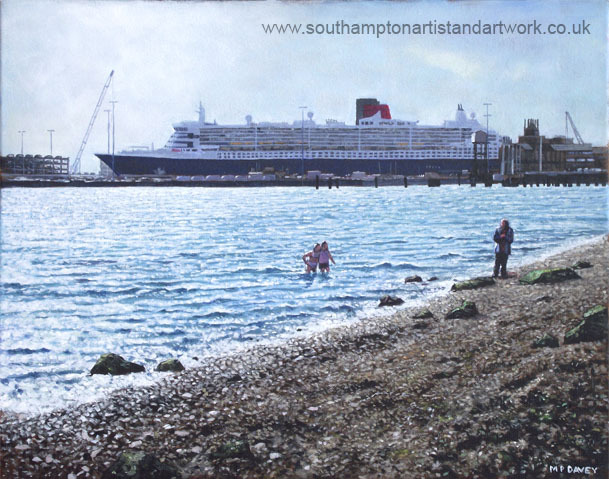 This acrylic painting shows the Cunard ship, Queen Mary, at Southampton docks during an evening in spring, 2012. The ship, the largest of the 'three Queens', is seen from the view point along Weston shore. Weston Shore is a shingle beach on the outskirts of Southampton city, on Southampton water leading in to the Solent. All ships entering and leaving this port can be seen here. The painting is based on a number of photographs taken one evening, and recomposed in photoshop. The image is then scaled up and transferred to a canvas measuring 20" x 16". The sun is getting low in the sky so the ship is becoming a silhouette, the waves now having bright, sparkly crests as they catch the low sun. The two children swimming in the Solent, with their mother watching, help to give scale to the shingle beach and the layout of the painting.